About $1.3 million was spent to reconfigure two jets before the general election. Kerry's primary campaign committee paid for most of the work. It cost more than $900,000 to customize Kerry's Boeing 757, including $63,103 for campaign decals on the plane's exterior. The price tag for reconfiguring Edwards' Boeing 727 was $300,738, including $224,894 for a new telephone system and $27,659 for decals. I would guess that probably included some extras — caller-ID? one-touch dialing? or maybe faster-than-light intergalactic transmission capabilities? If it were a phone system designed to ensure constant and secure EMP-shielded encrypted world-wide communications from, say, the actual Vice President — instead of just a wanna-be — I can imagine that one might have to start spending some big bucks for jet-borne communication systems. But for a candidate, just during a campaign, just to make phone calls while on an airplane flying from place to place inside the United States? 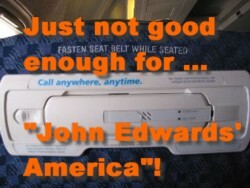 How many zeros does a campaign expenditure have to have after it to get John Edwards' personal attention? How many zeros does a campaign expenditure have to have after it before we can conclude with absolute certainty that this guy lacks the degree of good judgment commonly shared by most American six-year-olds? I think I have to step in and defend Silky Pony at this point. Sure, it's $224,894 on a phone system, but its an FAA Approved phone system. I'm guessing that the breakdown is $500 on the phone, and $224,394 in overhead for the company that makes it to get both FCC and FAA approval, passed on in the cost of the system. There's a reason that the same GPS unit that you can buy at Frys for $600 costs $9000 when it has an FAA approval certificate with it.